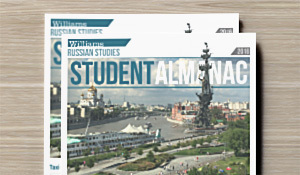 The Russian Program at Williams offers a wide variety of opportunities to study the language, literature, and culture of Russia and the former Soviet Union. In addition to a full curriculum of language courses conducted entirely in Russian, the program regularly offers courses in English translation devoted to Russia’s literary giants and the country’s rich cultural history. Especially popular are seminars on Leo Tolstoy and Fyodor Dostoevsky, as well as courses on Russian art, culinary history, and the history of Russian and Soviet film. The Russian program also sponsors a variety of extracurricular activities. Russian speakers on campus and from the local community gather once a week over lunch at Russian Table. During the fall semester, the program hosts a Russian Potluck Dinner, which allows students, faculty, and staff to try their hand at Russian recipes before tasting the results. In the spring, students taking Russian language classes perform at an annual Russian Talent Night, singing songs, reciting poetry, and performing skits entirely in Russian.We encourage all students studying the Russian Language to consider one of the many immersion programs available both in the United States and in Russia. These include Middlebury College’s Russian Summer School, at which students can complete an entire year of language study in the span of a few months, and a wide variety of study-abroad programs in St. Petersburg, Moscow, and other Russian cities. The Russian program also sponsors a unique travel course during Winter Study Period to the Republic of Georgia, where students undertake an internship tailored to their individual interests. Students can earn either a major or a certificate in Russian while at Williams. The Russian program’s small classes and intimate nature let us design courses to meet our students’ needs, fostering a warm and welcoming environment for studying the Russian language and the country’s rich literary and cultural traditions.